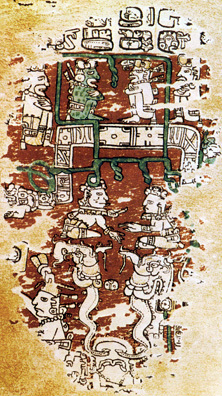 Throne scenes in the Paris codex share the same important iconography as on stelae at Piedras Negras and Quiriguá  complete with sky band, bound crocodile, Venus Monster, and even a Principal Bird Deity hovering overhead. The original of this hand painted book in Paris is effectively untouchable. This obviously makes it crucial to have a facsimile edition available, so that the entire manuscript can be studied. Only the Paris codex has a fascinating series of planetary animal and bird patrons similar to the series on the east wing of the Nunnery at Chichén Itzá. Codex Paris is first mentioned in 1832, when it was to be printed in Vol. 10 of Lord Kingsborough's "Antiquities of Mexico"; but this volume was never published. In 1859 Léon de Rosny found the Codex Paris in a basket with a collection of old papers black with dust and practically abandoned in a chimney corner of the Bibliothéque Nationale in Paris. He decided that it should be published under the name Codex Peresianus. Graz 1968. Vol. 9 of the series CODICES SELECTI. Improved reproduction of the Léon de Rosny color edition of Paris 1887, mounted in PreColumbian screenfold manner. The Codex is in possession of the Bibliothéque Nationale, Paris. 22 folded book pages (12 folios) in original size 125 x 250 mm. Introductory text in German by Dr. F. Anders, University of Vienna, all together 42 pages.